A midwest Poison Control Center called asking for information on a certain batik dye, 1 teaspoon of which had been ingested by an 18 month old baby. It seems that the baby's twelve year old sibling had been given two packets of powdered dye to use after school in a "homework" dye project. The next morning, the baby had gotten into the opened dye packet. The Poison Control Center called CSA because they could not locate the manufacturer, and therefore were unsure of the ingredients since neither the teacher nor school had a material safety data sheet (MSDS) on the product. CSA happened to have some information on the product, which was manufactured by a New York crafts company that has been out of business for a number of years. The information sheet stated that there may be small amounts of lead, zinc, or arsenic in the various colors, and that the dye works at a low temperature. 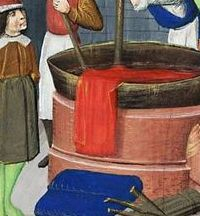 Salt, in the form of sodium carbonate, was the first concern if the dye was a direct dye, but it appeared that the dye was a fiber reactive dye from the temperature description on our old information sheet. The pediatrician reported no sensitization or allergic reaction in the baby, common reactions to exposure to fiber reactive dyes. Because the amount of dye ingested was small, the possible lead, zinc or arsenic levels seemed insignificant. No symptoms were noted on follow-up. This inquiry revealed several problem. First, the school was obviously not up-to-date on the maintenance of the art supply inventory. Second, MSDSs were not available on all products in use. Third, teachers were using products without approval from a health and safety committee. Finally, homework assignments with art products can be extremely dangerous because of the lack of supervision, or in this case, on the storage of the art materials after completion. Luckily, there was no serious injury or illness here.